Jordan Ingram reporting for FishDuck.com on the first day of Oregon’s spring football practice at the Hatfield-Dowlin Complex in Eugene, Ore.
Doug Brenner believes Jeff Lockie is a natural leader. After a long offseason, the Oregon Ducks football team held their first spring practice today. Many questions surround the quarterback position as Marcus Mariota‘s departure to the NFL draft has left a colossal shoes to fill. But one of several men protecting Oregon’s next quarterback for the 2015-16 football season, offensive lineman Doug Brenner, has noticed that redshirt junior quarterback Jeff Lockie has a horse in the race. The redshirt sophomore spoke with FishDuck.com about his observations on Lockie in the offseason. “[Lockie] has really stepped up these last few months. He’s a very hard worker and also a vocal leader on the team,” Brenner said. Lockie was Mariota’s understudy throughout the Heisman Trophy winner’s record-breaking three years as Oregon’s starting quarterback. While the dual-threat quarterback from Monte Vista high school has received the most exposure to the Ducks’ offense, his candidacy for quarterback has been overshadowed by a strong class of recruits and transfers, including four-star freshman Travis Jonsen (Waller), Georgia transfer Ty Griffin, graduate transfer Vernon Adams Jr., redshirt freshman Morgan Mahalak, and Sheldon high school graduate and walk-on Taylor Alie. This impressive quarterback “cartel” has some questioning Lockie as a favorite for the gig. Brenner, however, says Lockie has natural leadership abilities that have not gone unnoticed by the offensive line. “He’s a very smart guy and we have a lot of respect for him as offensive linemen, and we’re excited for him, Brenner said. 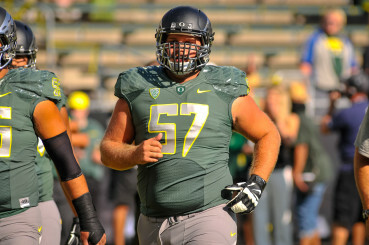 Brenner is one of the few offensive linemen returning for the Ducks this season after the departure of Hroniss Grasu, Jake Fisher, Hamani Stevens, and the early retirement of André Yruretagoyena. Doug BrennerJeff LockieMarcus Mariota Oregon FootballOregon Ducks QuarterbackOregon Football 2015Oregon Offensive LinemenTravis WallerVernon Adams Jr.